Geoff have you experimented with smaller magnets. For the BK modded small tensionlocks I use two 3m diameter by 4mm neodymium rods three sleepers apart on the centre line. It looks as though KDs would need them offset either side of a sleeper or just two appart. They have an advantage in that they can be adjusted by pushing down, or up from below, relying on friction to hold them in place. If they are flush with the sleepers they grab axles, but KDs have one thing in their favour, the tails point forward away from the axles. If you press them down it might be possible to pull the KDs apart without attracting the axles. I did the iron filings on paper trick and their field wraps tightly around them. There is still much experimenting to go on before I give up on the Kadee magnets. Set directly under fine scale track they were only 3.5 mm from rail head height, yet barely raised a twitch from the couplings. included a 180% turn of 4th radius curve. they require intrusive levels of wagon modification to work to a level of reliability that I for one demand. as I've done that on Castell Mawr. muff is so thick if fouls the screw mounting of the coupling pockets. that make Kadees fit for purpose ? on HS-II layout wagon brakes did the job .......BUT ....... The saga continues !! The problems with KDs and Uk stock are rather inherent. US stock does not have buffers, and is mainly bogie mounted so the ends don't have as much throw. When knuckle type couplers were introduced on UK coach stock they were mounted on horizontal pin through the back of the hook pushing them further out by about their own length, plus before they could be used a C shaped spacer (about 4" thick I think) had to be removed from behind the buffer head, and the head pushed in to close up the gap. All to extend the reach of the coupler. Pre NEM coupler pockets the front bar of a mini tensionlock coupler, set just 1mm ahead of the buffers gave a realistic gap for what was a loose coupled train. If you mounted an NEM pocket that far back, first of all it would interfere with the axle; and you would need very long KDs if they were ever going to couple. So they compromised the fitting for tensionlocks and European loop and hook couplings so that KDs could be included. It's taken me 10 days to go back and take the Hornby M7 apart again. After adding the decoder the chassis ran fine as I expected. I was thoroughly peed off and left it sitting on the bench mocking me !! wrong - was it loads of wires crushed into limited space above the decoder ? Taken apart, the wires teased loose before sitting on the track and trying again. decoder did odd things before shutting itself down. and two sets of pick-up wires - from main drivers and trailing bogie wheels. Oh joy - it can go back to the club rooms now !! Meanwhile I continue to fight the Kadees for a level of consistant operation I demand. 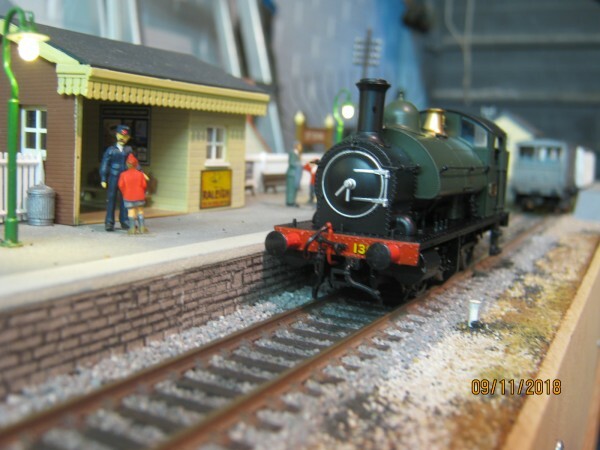 Model railways - Kids Play ?????? !!!!! space to keep this new layout on which tonight John has been doing some gardening. Perhaps a photo next week if I remember the camera. the brass wire wagon brakes it worked 100% Great !!! layout. Never a dull moment ! Today it's dull, damp, with low light levels - Oh the joy of Autumn ! 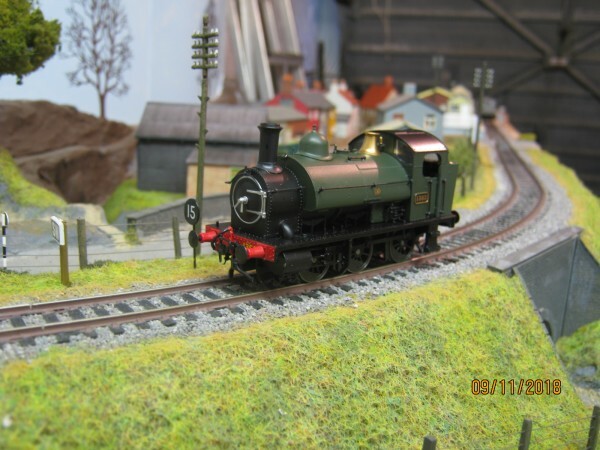 thinks they can paint reasonably well a low cost way of adding stock to their layout. 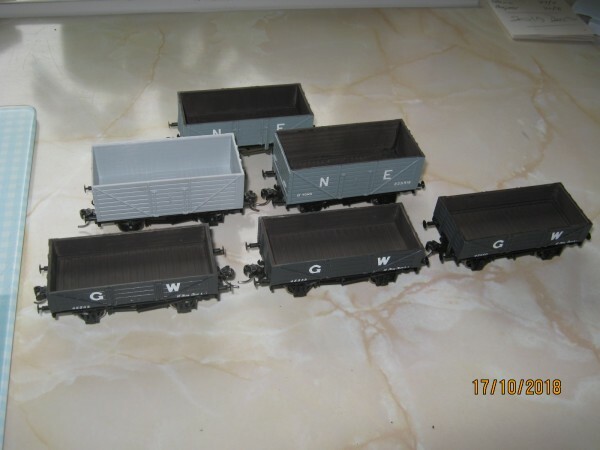 to mix in with these big 4 liveried models. Next they all need a long and messy weathering session ! If you look back a page or two you'll find my 'HSII -The Kadee Experiments' layout. for me to use and I've kept to the 308 large underboard magnets. I just hope somebody prepared to give-up will continue, you see it CAN be done (just). 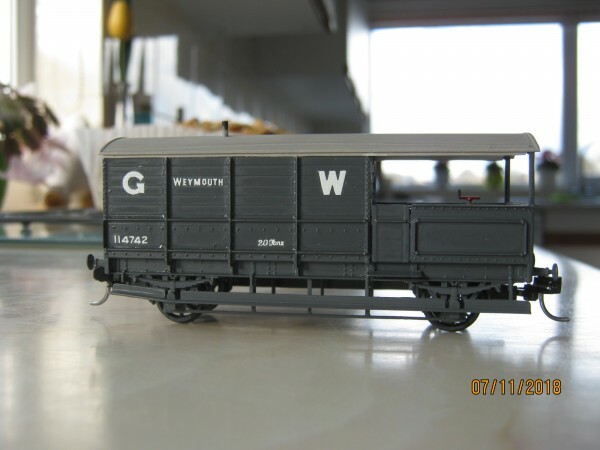 Vehicles for point switching. Ingenious! This is proving to be something of a rolling disaster. and a run-away train damaging one of the delicate Lanarkshire white metal buffers. the external circumference. I also may need to de-solder the switch rail and move slightly. Unless you are more interested in looks than reliability I'd suggest you stay with Peco code 75 !! You are right about looks-v-reliability, the Peco points have a higher likelihood of consistency, than the basically handmade Marcway points. A good dose of pragmatism needs to go into any multi-purpose/multi-user layout. At the end of the day the viewers who may be delighted by appearance are also going to be the strongest critics of performance. It's one of those choices you can't win. I keep flitting about between my Workbench and this layout thread. At the moment both are closely entwined and hence the current picture. and in typical pedantic modeller style that's what I wanted !! but they had varied font size as was the historical case !! Your attention to detail astounds me. Cracking job with the decals, there certainly won't be another one around like it. Ahh Dave, but we'll appreciate it when you do start rolling again. Not really as they don't all pull into the free shunting mode. However a slow speeds (as wanted) some, Just some, uncouple when passing over. Too free running perhaps, not really as even 'braked' wagons uncouple at unwanted times. Brakes not on enough ? On a 6 wheel milktank the braked axle set locked at times !! to operate the yard. We also HAVE to work with single wagons because of space limitations. The 'Kings Clothes' always comes to mind. However they DO work with a couple of coaches. It's going to need many hours of running-in !! work is easy, can't do that on West Bay, being end-to-end.